The noise just gets louder every day: the wailing of those seeking refuge from conflict and the snarling of those alarmed by their advance; the yelling of leaders pursuing their own agendas and the weeping of those not given a chance; the war cries of those who seek our extinction and the hysteria of media desperate for attention. It’s deafening. It’s debilitating. It’s definitely compelling. The technical term is ‘fucked’. No wonder so many people are seeking refuge in quieter, more contemplative music. In the mainstream, naturally, gaudy neon lights still illuminate the path to stardom for those who bellow loudest or stoop lowest. But, in the shadows, something’s been changing. Where ten or fifteen years ago instrumental post-rock like Tortoise’s and Sigur Rós’ served the needs of those looking for respite from nihilist grunge and self-congratulatory Britpop – the latter surely a key antecedent for our contemporary Brexit predicament – now there’s an ever-growing tide of far more peaceful music humbly drawing our attention away from the rowdy self-deception of today’s popular artists who seem, for the most part, timid in the face of injustice and turbulence. Take Nils Frahm, for instance, or Max Richter: each has reclaimed techniques associated with classical music, long regarded as archaic and irrelevant, and won sizeable audiences, even for shows – in Richter’s case – in which the stated aim is to lull the listener to sleep. Then there’s the rising tide of ambient music, fed by labels like Thrill Jockey, Denovali and Kranky, who offer increasing numbers of acts for whom downtempo simply wasn’t downbeat enough: the likes of Barn Owl, Mary Lattimore & Jeff Zeigler, Birds Of Passage, Ensemble Economique, Christina Vantzou and Loscil. It’s not protest music, needless to say. Somehow that genre seems to have been largely silenced, even if it still exists, something Norwegian artist Moddi explores on his forthcoming, extraordinary Unsongs collection. At any rate, these days, that’s considered, by many, an ineffective form of dissent. No: what’s emerging is rather more self-indulgent and defeatist, but nonetheless significant and rewarding. What unites the appeal of these – ahem – ‘neo-classical’ and ambient artists is their evocation of an alternative universe in which one can entirely lose oneself. It’s music in which the horrors of the age recede, allowing one to seek comfort instead in elegant – if briefly lived – sophistication. 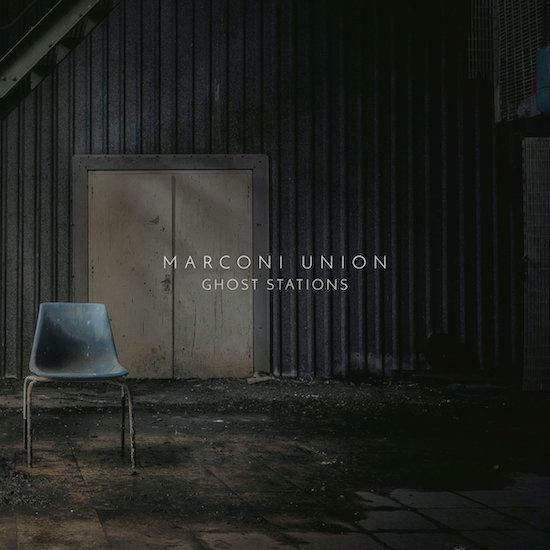 Nevertheless, Marconi Union have always excelled at the creation of a sonic space in which to shelter. Ghost Stations represents a certain change of tack – long-term fans may, despite its title, be surprised by the often energetic nature of opener ‘Sleeper’ – but its accomplishments deserve to seep through its gossamer veil to find a public in need of reprieve. It’s not an obvious match with the neo-classical or ambient crowd, it’s true – it’s almost exclusively electronic, and carefully structured, even at its most amorphous – but both styles can be identified as related. It serves a similar purpose, therefore, conjuring up an immersive, crepuscular, alternative reality that may be recognisable to those who love the subdued atmospheres of, say, Boards Of Canada – or even early Blue Nile – but who aren’t, as yet, quite ready to surrender to something more nebulous. Clues to its mood can be found, of course, in its title: Ghost Stations is designed to arouse thoughts of “abandonment, empty spaces and dereliction”. But that denies the album’s soothing, ultimately positive nature. It may offer a melancholy tour of desolate scenes, but they’re lent the nocturnal beauty of ancient structures bathed in subdued lighting, any sense of threat exchanged for a reassuring sense of security. Thus its four, ten-minutes-plus instrumental tracks merge into one – indeed two boast twin titles, ‘Remnants / Shadow Scheme’ and ‘Abandoned / In Silence’ – and its forty six minutes pass in a largely hushed fashion, their production so immaculately pristine that they invite the loaded term ‘tasteful’. But these apparently flawless surfaces hide unsettling details, like the scratching and rattling that lie, submerged, within the opening minutes of ‘Sleeper’, before it slowly swells into the kind of territory Massive Attack explored on Mezzanine, further embellished by the appearance of Italian trumpeter Girogio Li Calzi’s muted tones. (Intriguingly, the track also sounds like a distant, digital cousin of ‘Ceramic People’ by Nils Frahm’s recently unveiled band, nonkeen.) ‘Remnants’, meanwhile, opens with what could be an outtake from Frahm’s Victoria OST, its piano chords underpinned by subtly reverbed, decorative synth notes. This then slowly expands into something Jóhann Jóhannsson might compose in his quieter moments, and even when it shifts into ‘Shadow Scheme’, there’s an imaginative tumble to the beat and a purgative sense of resolution in its final 150 seconds. ‘Abandoned’, meanwhile, finds the trio at their most tranquil, its keyboard washes interrupted only by Digitonal’s Andy Dobson, whose clarinet increasingly dominates a slow drift into the second half, ‘In Silence’, in which his central melody somehow echoes Talk Talk’s exquisite ‘April 5th’. ‘Riser’ then blends all these strengths, its propulsive rhythm emerging from a sci-fi-slick, monochrome soundscape that brings to mind the work of another 80s associated artist, David Sylvian, on instrumental collections like Gone To Earth’s second disc. There are hints, too, of John Carpenter in its overt key changes. But a human element – warmth – remains at is core, underlined by a further appearance from Li Calzi. That it concludes with two minutes of mesmeric keyboard swathes – the kind that cynics might justifiably deem best employed during massages – underlines the album’s fundamental achievement: to assuage and alleviate. Ghost Stations doesn’t solve anything, of course. The noise outside will continue growing, partially because we’ve become ever more skilled at finding ways of drowning it out. It won’t win awards for innovation, either: part of its charm, in fact, is its familiarity, though it probes more expansive territory than Marconi Union often do. But it offers an opportunity for recuperation and contemplation, and such chances are increasingly precious. In fact, given the ugly battles that may well lie ahead, both could soon prove vital.